Electricians have many different ways they stay up to date with electrical code compliance. Remembering and learning new code in creative ways is part of their lives. All of our skilled electricians have extensive training, receive continuing education and other incentives to stay on top of electrical code compliance. Our expert electricians are also licensed and insured for your protection. Professional electricians understand the National Electrical Code (NEC). The NEC sets the foundation for commercial, industrial and residential safety. The NEC is a United States measure for the installation of electrical parts, components, wiring, and equipment. The NEC is not a mandated law, however, using and following the guidelines of NEC is usually mandated by state or local law. By following the NEC, electrical code compliance provides homes and businesses with safe electrical installations. Every three years the NEC is updated and published. The 2017 NEC edition is the most current. Electrical code compliance is essential, and code violations can make your home or business unsafe, putting people and property at risk. When an electrical system is installed, the expert electricians must fully comprehend electrical code compliance and the requirements for the greater Gilbert AZ area. We provide electrical code compliance and correction services from experienced electricians. We will safely inspect the electrical system at your home or business to make sure it is up to code. If we discover anything that is not up to code, we will get it up to code immediately. Your electrical service and breaker panels will also be evaluated for proper connections and breaker usage. 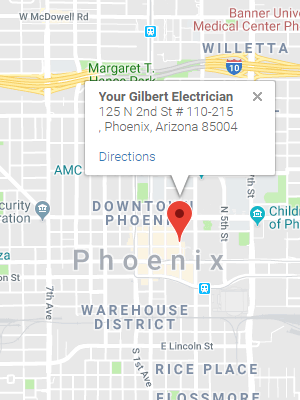 If your Gilbert AZ home or business has experienced any electrical code violations, we can help get it corrected promptly, so people and property are protected. A building inspector may require updates if something is not up to code or wiring is unsafe. You must comply with the NEC and local codes with new buildings and extensive renovations. We practice electrical code compliance as determined by the NEC and the local electric codes. An electrical system provides your home or business with all the power you need to live, operate, function and be productive. Reading through these codes and understanding them is a task as they are long and technical. Electricity is all about the charged atomic particles and how they react with different elements. It is something to be respected and appreciated. Electricity gives us a luxury and convenience. While we live a life filled with conveniences because of electricity, we need to be sure the electrician we bring into our home and business practices electrical code compliance. Electrical fires, electrocution and other risks to your safety, home and business can all occur when there are mistakes with wiring, grounding or equipment is not installed and operated correctly. It is essential to hire an electrician who strictly adheres to the NEC and local code and practices electrical code compliance. There should be wall receptacles every 12 feet. We have well trained and knowledgeable electricians who understand electrical systems, components, and electrical code compliance. Our licensed electricians are skilled and knowledgeable about the NEC, state and local codes. Each electrician takes pride in following electrical code compliance in homes and businesses throughout the greater Gilbert AZ area.